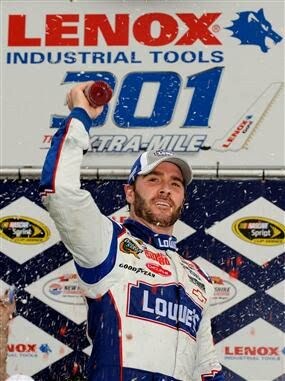 LOUDON, N. H. – One of these days, people will stop doubting Jimmie Johnson. The four-time NASCAR Sprint Cup Series champion can lose a race, or two, and folks automatically write him off as a contender. Sunday, at New Hampshire Motor Speedway, Johnson played second fiddle, as he sometimes does, for most of the LENOX Industrial Tools 301 before putting a payback bump-and-run on Kurt Busch. Busch had nudged Johnson aside with seven laps remaining with a bumper-tag finesse usually associated with ballet, but this high-speed dance was sheer poetry in motion. Johnson repaid the favor with just a few laps to go, providing high-end drama to a race that had only four caution flags. Tony Stewart slipped past Busch for second place on the last lap. Busch was third. Jeff Gordon was fourth and NASCAR Sprint Cup points leader Kevin Harvick finished fifth. Rounding out the top 10 were Ryan Newman, Clint Bowyer, Dale Earnhardt, Jr., Joey Logano and A. J. Allmendinger. Kyle Busch, one of the leaders and a contender all day, wound up 11th after colliding with Jeff Burton and spinning during one of the late restarts. Burton, who led 89 laps, was a definite factor before the spin. Kyle Busch led 46 laps. Sunday’s victory was the 52nd of Johnson's career and his fifth of this season. Pole winner Juan Pablo Montoya and fellow front-row starter Kasey Kahne led laps before problems sidelined both drivers late in the race. Kahne, who led a race-high 110 laps, lost an engine. Montoya, who led 36 laps, was wrecked by Reed Sorensen. Montoya jumped off to a good start when the green flag fell, pulling ahead of second-place Kurt Busch by a little more than a second. The top 10 at Lap 25 were Montoya, Busch, Kahne, Newman, Bowyer, Johnson, Newman, Mark Martin, David Reutimann and Gordon. Debris in Turn 3 brought out the first caution at Lap 35. Kahne beat everyone out of the pits, followed by Martin. Montoya quickly advanced from fifth place to second. Kahne pretty much controlled things during this part of the race. Kyle Busch had moved to second, dropping Montoya to third with Burton on his bumper and Gordon running fifth. Kyle passed Kahne for the lead shortly before the halfway mark.